On August 15 2018, the Quebec Gay Archives held a two-part event at the Cinéma du Parc. Gabriel Girard and John Banks were the two guests of honour. The lecture and film screening, along with the poster exhibition (held August 1-31), were part an event “The Quebec Gay Archives at the Cinéma du Parc!” celebrating the 35th anniversary of the Archives. “Sida, enjeux de mémoire, enjeux de saviors”. Dr Girard is a member of CREMIS (Centre de recherche de Montréal sur les inégalités sociales et les discriminations). He is currently employed by the Direction régionale de santé publique. A question period with the general public followed his presentation. 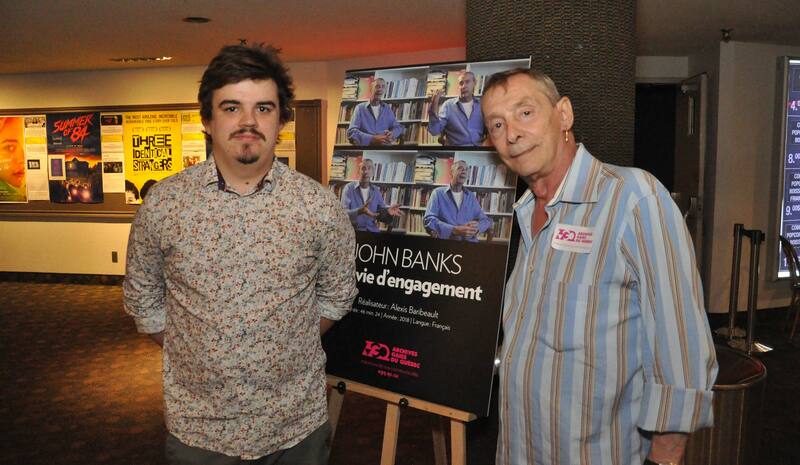 Following the lecture and a short appearance by John Banks, the subject of « John Banks, une vie d’engagement » (46 min., 2018), the public was treated to the premier of the film. John Banks shone during this testimonial of a rich and interesting life. This film was produced by the Quebec Gay Archives as part of an internship held by Alexis Baribeault (as director of the movie). Who is John Banks? Born in Montreal, John Banks has been a noteworthy activist for several decades. As well as being the personal secretary of the legendary Marlene Dietrich, he has been involved with a great many LGBTQ+ community organizations over the years. John Banks currently devotes a great deal of his time to the Quebec Gay Archives. The Cinéma du Parc was a sponsor of “Les AGQ au Cinéma du Parc!” along with Fierté Montréal, Fugues and several donors. Note that Fierté Montréal graciously sent its official photographer, André Bilodeau, to commemorate the evening. Samuel Bonnefont, web and social network coordinator of REZO, also filmed the lecture. “The Quebec Gay Archives at the Cinéma du Parc!”, Wednesday, August 15 2018. Upper: Gabriel Girard during his conference (Salle 2, Cinéma du Parc). Down: Alexis Baribeault and John Banks. Photo Credit: André Bilodeau / Fierté Montréal. All rights reserved. « The Quebec Gay Archives at the Cinéma du Parc.